So you have been hearing about this new "Avatarland" coming to Disney’s Animal Kingdom for years now. You didn’t understand the hype about the movie when it came out. Maybe you haven’t even seen it. You don’t get why they are putting a land based on a movie in a park dedicated to animals. It is almost inconceivable that it took them several years to build a few rides. Now that Pandora: The World of Avatar is open you are subject to commercials every time you turn on ABC, your instagram and facebook are flooded with ads and photos and you just don’t understand WHAT is the big deal!!!! First, let me just say I completely understand where you are coming from. I wasn’t excited about the prospect of Avatar coming to Disney Parks. What I was excited about is what two incredible minds like Joe Rhode (Disney Imagineer) and James Cameron (Avatar Director) could not only conceive but realize. I am also excited any time Disney adds something new to their parks. But I had never seen the movie!! I thought about watching it as preparation for my trip but then reconsidered. I wanted to be able to say whether or not you truly had to watch it to fully appreciate this new land. Well do you? Unfortunately this is not a straightforward answer. 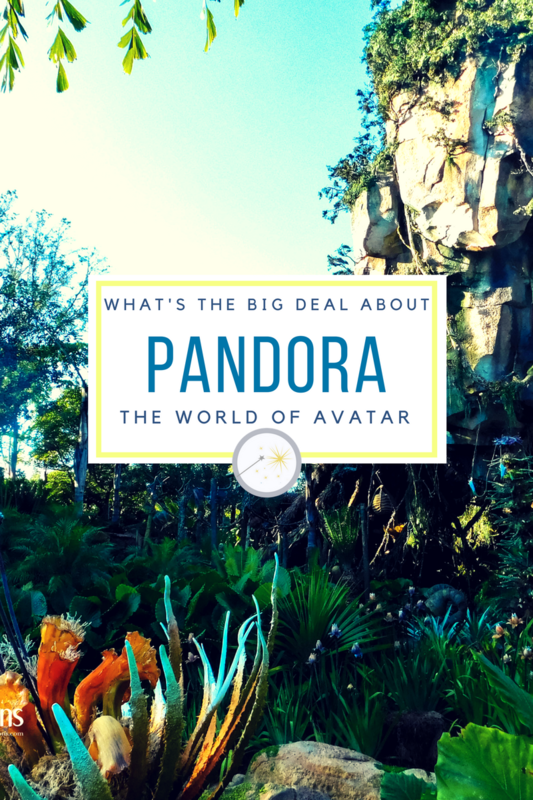 Let me tell you a little bit about Pandora before I give you my official answer. The primary reason for this trip was to experience the new land. With two new attractions, a new quick service restaurant (serving breakfast, lunch and dinner) a snack vendor and (of course) a gift shop I knew I could not explore it all in one visit. Both of Pandora's rides—Avatar Flight of Passage and Na’vi River Journey—are available for FastPass+ but due to the high interest, guests are only allowed to reserve ONE of these two attractions per day. They will then have the option to select two other FastPass+ reservations at other Animal Kingdom attractions. So I took this into account when planning my park days and planned a morning and an evening visit to Pandora. When it came time to select my Fastpasses I was up before the booking window opened at 7am (this is one reason it is great to use a travel agent… they will do this for you!!!) and was lucky to get Fastpasses for both attractions. When we arrived for our first visit we made sure we were there early… I mean EARLY. We left our resort and arrived at the turnstiles at 7am even though the park didn’t open until 8. There were already hundreds of people in front of us. Every 15 min or so they would let us a little bit further into the park so it didn’t seem like a very long time. Finally at about 7:45 they let us into Pandora. Most of the crowd headed directly to the Flight of Passage Pandora’s headline attraction, we had a FP+ for it later in the day so we went to the Navi River Journey. Despite all the people in front of us waiting to get into the land, we were on the first boat of the day! Na’vi River Journey The Na’vi River Journey is the family attraction in Pandora. It is a slow boat ride (think it’s a small world or living with the land) that takes you through the bioluminescent wilderness of Pandora. The queue features native Na’vi art that really captures your interest and actually had me wishing the line was longer so I wasn’t walking right by it. You are loaded onto what is supposed to be two small hewn rafts tied together. You are then transported to the wilderness. While the attraction as a whole is a little underwhelming the technology is incredible. To create the feel of a fluid, realistic enviornment Disney uses semi-transparent screens with background scenes that also use projection technology in a lush traditional three- dimensional forest. There is truly so much to see you are completely overwhelmed on your first journey. What you will be underwhelmed by is the lack of story. The ride is also only 4 ½ minutes long. While you do get to see the incredible Shaman of Songs - Disney’s most advanced and fluid audio-animatronic, you have no emotional investment. You walk away wishing you had gotten more weight but you also want to ride again to pick up on any details you may have missed. Satu’li Canteen - Breakfast At this point we were starting to get a little hungry. We were over on the other side of the land when we decided to head over and grab some breakfast. Satu’li Canteen offers mobile ordering so while we walked over I pulled out my phone and we each picked what we wanted. While we neared the Canteen it gave me the option to say I was there - by the time we went inside and reached the counter our food was ready. It was INCREDIBLE!!! It is no secret that Animal Kingdom has never had a plethora of breakfast options and with this now open I don’t know why anyone would go anywhere else. We got a little bit of almost everything just to try it. ●	Breakfast Steamed Pod - Steamed pods filled with scrambled eggs, bacon, spinach, cheddar cheese served with pickled slaw - $8.49 ●	French Toast - Cinnamon swirl French toast topped with blueberry cream cheese dollop, passion fruit anglaise and pork sausage - $7.99 ●	Fresh Fruit Plate - Pandoran tropical fruits served with fresh yogurt-muesli topped with vanilla scented maple syrup - $7.99 ●	Pork Hash - Slow roasted pork and potato hash topped with grilled chorizo sausage, green onions served with natural jus - $8.99 ●	Steak and Eggs - Vegetable-goat cheese frittata and wood fired herb crusted beef, with chimichuri sauce. - $9.99 ●	Steel Cut Oatmeal - Steel-cut oats, topped with caramelized brown sugar, bourbon-soaked raisins, marcona almonds and goji berries. 21 and older! - $7.49 The breakfast steamed pod was good but it was a little bland, they needed some sort of sauce to perk it up. The French Toast was good, it was a little dry but the blueberry cream cheese and passion fruit sauce perked it up. I wish I could bring the passion fruit sauce home with me, it was SO delicious. The Steak and Eggs features the same steak that is available as a part of the bowls at lunch and it is amazing. It is cooked perfectly. The herb crusting is perfectly balanced and gives it excellent flavor that doesn’t over power the meat. The frittata was good but got left behind in favor of the amazing steak. The real winner though was the Pork Hash. The hash was crispy but fluffy, the pork understated and the chorizo had a little kick to it. The dish was perfect! I was a little confused about the atmosphere, the line and the counter looked like a military or facility but the seating area was very native inspired. It was a cool juxtaposition of the scientific and the natural but it didn’t seem to fit together for me. Windtraders Shop Because the mobile ordering was so efficient we still had a few minutes before our fastpass window opened so we popped into the gift shop. I am a HUGE fan of unique merchandise. I hate walking into a Disney gift shop and seeing exactly what I saw in the other Disney gift shops. In Windtraders there is absolutely NO sign of Mickey mouse. Unfortunately the popular Banshees were sold out so we didn’t get to experience being matched to one. From what I hear it is still pretty hit or miss whether they have a shipment in stock. We did watch some people get an avatar of themselves created which was pretty cool but a little too pricy for me not being an Avatar fan. I did love exploring all the other merchandise. They had walls of apparel inspired by native art. They had glow and the dark accessories. You can make your own native jewelry. They had costume pieces and a ton of toys. The variety and quality of the items in there was inspiring. I hope Disney keeps up this trend! Flight of Passage Finally after a trip to the restrooms (which are new and clean but underwhelmingly themed) we were finally off to use our fastpass and find out what all the hype was about. We were there the 3rd weekend after opening, our fastpass was for 9:30 and the line was already 280 minutes long -- yes that is more than 5 hours. The line wrapped through the Valley of Mo’ara past Satu’li Canteen and down the trail to Africa where a poor cast member stood at the end of the line. We jumped right into the FP+ line and were ushered into a long sterile hallway. If you are a WDW veteran you know they are a fan of the “pre-show” and may be able to quote a few. Well the Flight of Passage has not one but two pre-shows. The first you are brought into a room, assigned a number and matched to your avatar. In the second the backstory is explained, I think they did a good job and I definitely understood what was going on despite never having seen the movie. You are then brought into the room with the ride vehicles, told to put EVERYTHING and I mean everything… yep! cell phones too! Into a cubby on the back wall. The ride vehicles are a little uncomfortable at first but about halfway through the ride I finally figured out the best position and got settled in. So the idea is that on your ride vehicle you are linked to an avatar already in flight on a banshee above the Valley of Mo’ara. You participate in a first person simulation of flying on one of the powerful flying ikran which is a right of passage for the Na’vi. It is an attraction similar to Soarin’ but it is much more intimate and immersive. It has been a very long time since I rode a Disney ride for the first time. I was definitely a little anxious and don’t think I fully appreciated how well Disney transported me to a fictional world. You truly feel like you are there. The graphics were incredible. Make sure you really pay attention to everything around you including your ride vehicle. It is definitely the best ride at Walt Disney World and brings together technology, storytelling, thrills and emotion to give you this amazing feeling you have been transported. It was the perfect length and as you walked away the only thing I could say is Wow! We then started making our way over to Kilimanjaro Safaris to use our next FP and continued our day in the Animal Kingdom. I had purposely planned our evening return to Pandora a few days later to give myself the opportunity to watch the movie during some of our planned afternoon breaks. I typically travel with my FireTV stick so I can access my video library from my hotel TV. I had pre purchased Avatar but quickly found I didn’t need to because the cross- marketing geniuses at Disney had Avatar playing on a loop on one of the hotel channels. While I felt I enjoyed and appreciated the land before after having seen the movie so many things made more sense to me. I noticed small things in the Valley of Mo’ara I hadn’t before. The theme of conservation and preservation was not only more prevalent but more personal. Everything just made a little more sense and had a little more weight. We returned a few days later to use our Fastpass on the Na’vi River Journey. I definitely enjoyed this much more the second time. I recognized some of the wildlife from the film and spent less time trying to figure out the story and more time just enjoying the details. Satu’li Canteen - Dinner This is definitely where having watched the movie made a much bigger difference. I now understood why the natives were trying to reclaim what had been a research facility. I actually loved how the native art was woven into a hangar. Instead of being confused it felt comfortable. The giant robot outside the dining establishment also felt a little less out of place. Dinner at the Canteen was just as if not even more delicious than breakfast. Here you get to pick your meat, then a base and then a sauce. The Canteen is now offering a sampler platter with all the meats, bases and sauces choices for at least 4 people. I wish they had had this while we were there it would have helped me figure out which pairings I enjoyed the most. We did get everything but the Curry Pod and Tofu bowl. The Cheeseburger Pod was delicious, it tasted just like a McDonald’s cheeseburger just make sure you remember to grab ketchup. The Grilled Beef had the same steak as breakfast and was just as incredible. The chicken thighs were perfectly cooked. The sustainable fish was probably my favorite. Not only do I love mahi the flavor was perfect and the slaw and boba balls added a great variety of textures. The quinoa base was more kale than quinoa. The hash was just as delicious as breakfast but seemed a little heavy with the light meat options. The rice was perfect and probably paired the best with each of the items. None of the sauces really stood out. They were all good but none were memorable. Skip the signature Sangria and get a drink from Pongu Pongu just outside. Flight of Passage Queue We were staying at a Disney resort so after we enjoyed Rivers of Light (pretty and fitting but not worth waiting in line for) and a few night time rides on Expedition Everest (sooo much cooler at night) we went back to Pandora for the special Extra Magic Hours. They close the line to day guests about an hour before the official park close. We got in line about 15 minutes before the extra magic hours began, we were told to expect an hour to an hour and a half wait. We only waited 30 minutes. The queue is so incredible that I wished we waited longer. We were moving the whole time and didn’t really get to enjoy the incredible detailing in the queue. The outdoor part of the queue gives you a completely different view of the floating mountains. The indoor queue really sets the backstory. I think I would have enjoyed the ride so much more if I had walked through this queue. You feel the importance of the ritual much more, though this was also one of the items I appreciated more after having seen the movie. You walk through a mountain cave with ancient drawings of banshees, a bioluminescent forest, a decaying moss ridden research facility, then finally an operational one with incredible detailing and several research projects on display. You then begin the pre-shows. Being able to enjoy the ride without worrying about what was going to happen and recognizing some of the environments from the movie definitely increased my enjoyment of the ride. There is so much more I noticed the second time and I can’t wait to go back and watch it again. Valley of Mo’ara at Night Pandora at night is just a breathtaking as you have heard. Everything that was awe inspiring during the day is taken up multiple notches with the bioluminescence. Things you didn’t notice during the day are highlighted giving you more to explore. No matter how long you explore you will not be able to not be mesmerized by the glowing ground. I really recommend going later at night as the park gets darker and your eyes adjust. What was stunning when we got in line for Flight of Passage was remarkable as we left. Make sure you stop at the photopass locations. Even if there is a line the photos are totally worth it! Animal Kingdom at night is a completely different experience. The park comes to life in a whole new way. The energy is contagious but that’s a blog for another time! So do you need to see the movie before you go? You will enjoy Pandora no matter what. The land is so immersive, creative and inspiring to anyone who visits. What I do think is that you will appreciate a lot of the detailing more with the context you will get from watching the film. My parting thoughts: Plan a meal at Satu’li Canteen and make sure you take some time just to take in your surroundings. I spent quite a lot of time there but do not feel like I got a fraction of what the land has to offer. I can not wait to go back and explore some more. If you want to take the journey to Pandora contact your As You Wish agent for a free no-obligation quote! Fort Wilderness Campground - so much more than camping!